Used for non-cylindrical chucking or to assist a primary cylindrical chucking mechanism for turning, milling, and grinding. 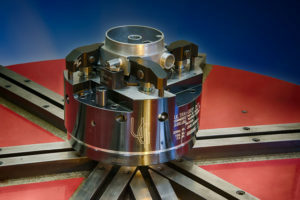 Part location is determined by items such as guides, orientation pins, interchangeable pin plates, and primary chucking mechanisms such as a collet chuck. Ultra-Grip Int. designs manual and power swing clamp Face Clamping Chuck to suit our customers’ part and machining requirements. Direct downward pressure provides positive pull-down against part stops. Sealed high travel rotating clamp arms. Actuation: pneumatic, drawbar, or spring. Distortion free location of a centered thin wall parts. Bevel gear pitch line location. Quick-change couplings for pitch line gear plates. Work support for secondary locating and/or clamping surfaces.